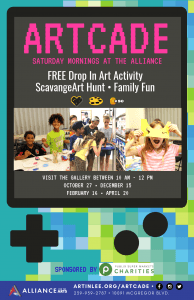 No pun intendo, but ARTCade will take your Saturday to the next level. Details for each program will be posted as soon as they are available. 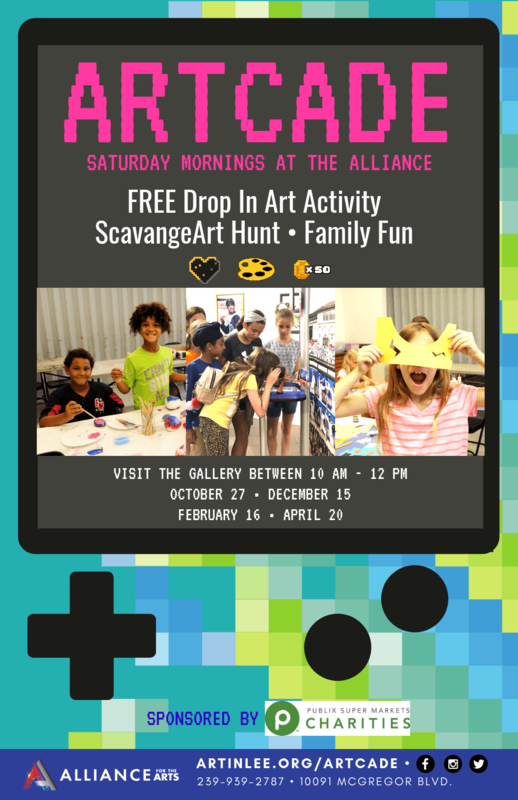 Recommended for ages five and older, but entire families are encouraged to participate. 4/27 – Jennifer Shamrock. Celebrate spring and create whimiscal flowers and pinwheels. 10/27 – Learn about Dia de los Muertos with instructor Vania Garcia and create a vibrant sugar skull rock painting. 12/15 – Samantha Hower presents Small Works from Small Hands! Create string art ornaments, mini wreaths, pinecone owls and pom-pom Santas! 2/16 – Doug MacGregor, put a smile on your face and create your own self-portrait with cartoonist and teaching artists, Doug MacGregor! Special thanks to Publix Super Markets Charities and Cape Coral Kiwanis Foundation for supporting young artists!